Writing a cover letter when applying for any job position should be a priority. 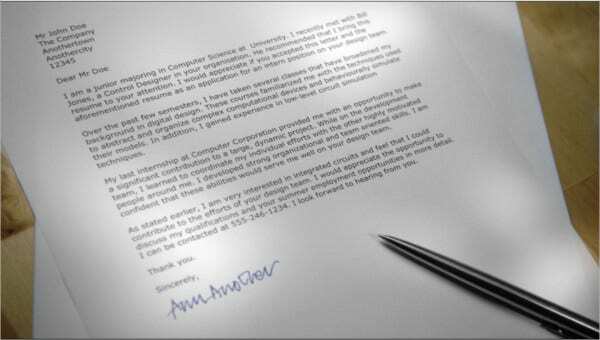 A well-written cover letter could help you earn an interview for your dream job. Employers look into comprehensive cover letter format and shortlist those applicants who have written good ones. One should be reminded that it isn’t only about a presentable cover letter salutation. It is also about the appropriate credentials that form part of the content of your cover letter. Whether you opt for an actual or an Email Cover Letter, your goal is to make your prospective employers leave a positive impression on your cover letter. It all depends on the job position that you are applying for, how you structure your cover letter should coincide with what you want to relay. If you are currently applying for research jobs, then the steps below could be of great help to you. Business letter format. Start off with the basics when writing a resume cover letter. Observe professional choice of words and formatting as well. Enthusiasm for research. Your language and tone of writing must establish your interest for the job position that you are applying for. Research experience. Employers would look into relevant experience. 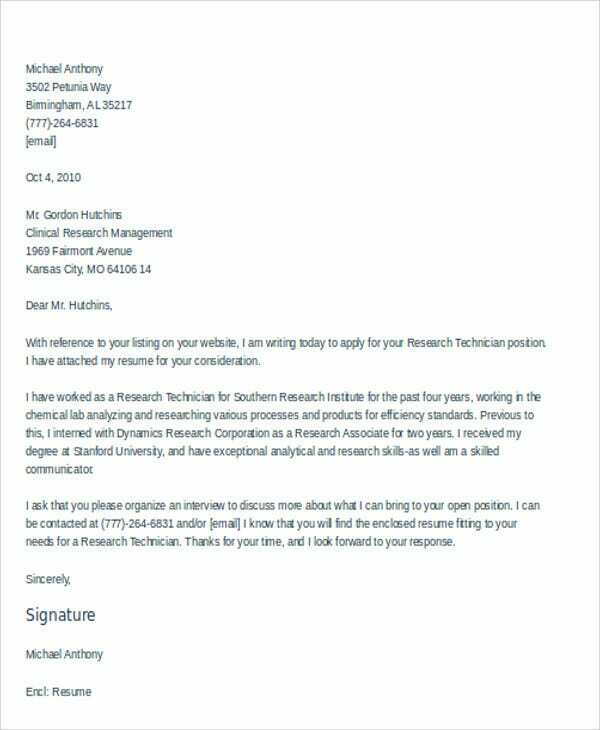 In this case, you need to showcase your experience on research to increase your chances of getting hired. 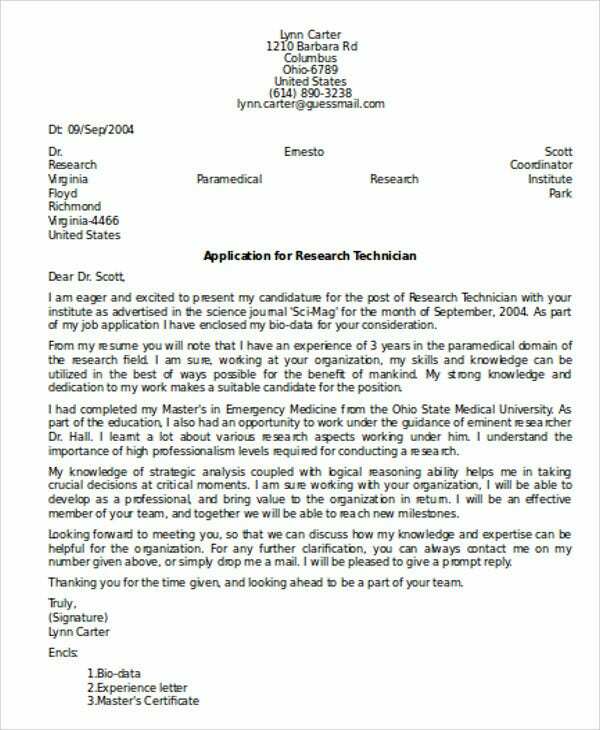 Download Cover Letter Templates. You could always secure yourself with a ready made cover letter template that already has an ideal outline for you to fill out. 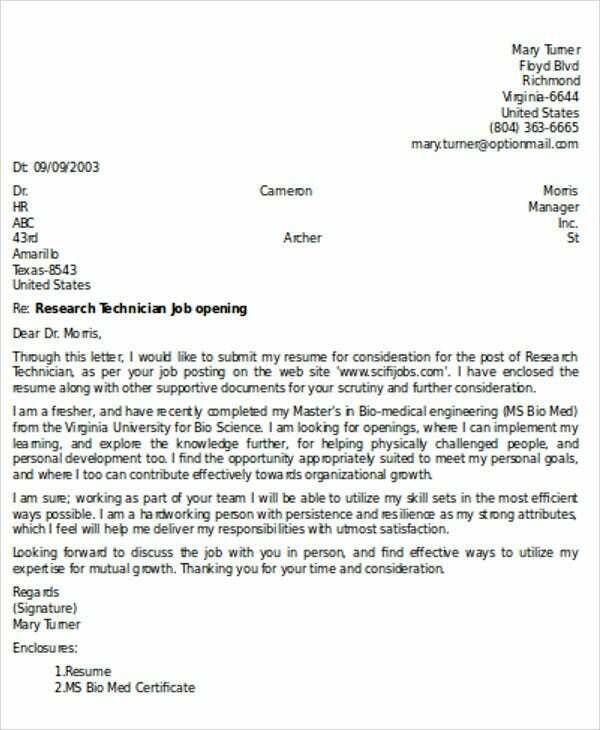 Check out our page further for more easy to download and edit Entry-Level Cover Letter Templates. 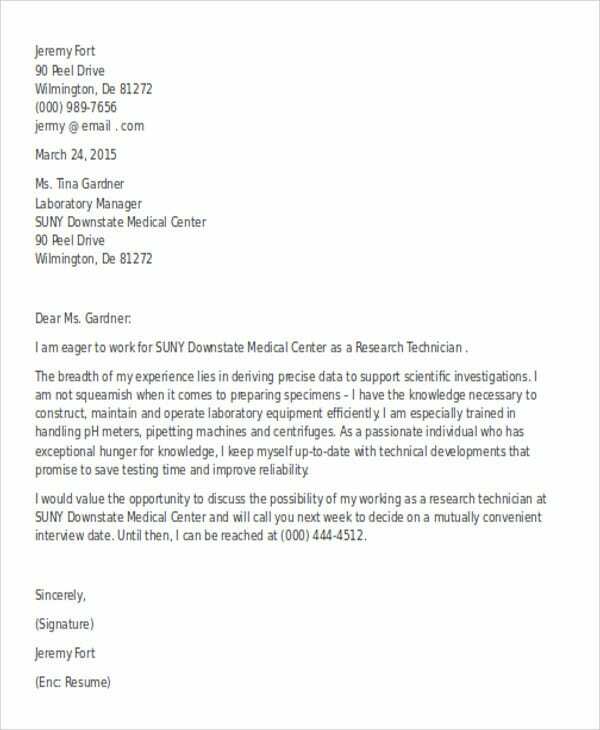 As an applicant for a professional cover letter sample for the technician, your skills and expertise must also reflect on how efficient you write your cover letter. Formal letter format. 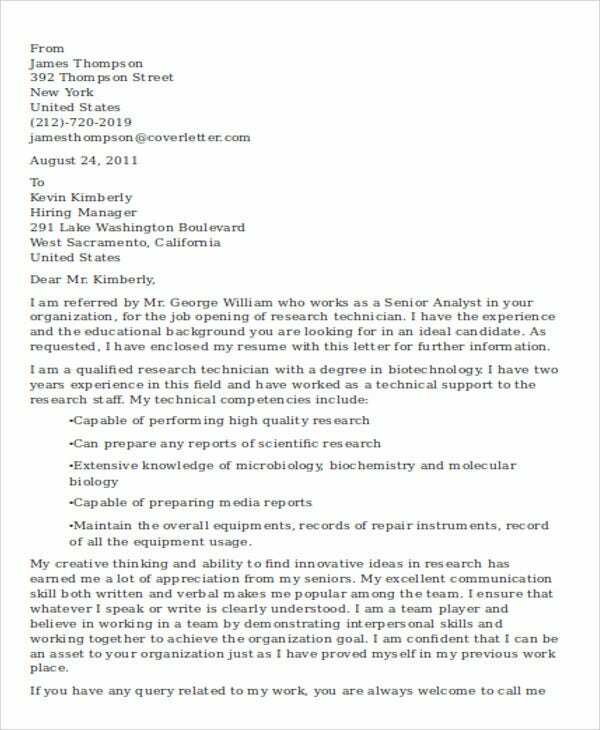 A professional cover letter needs a formal letter format. 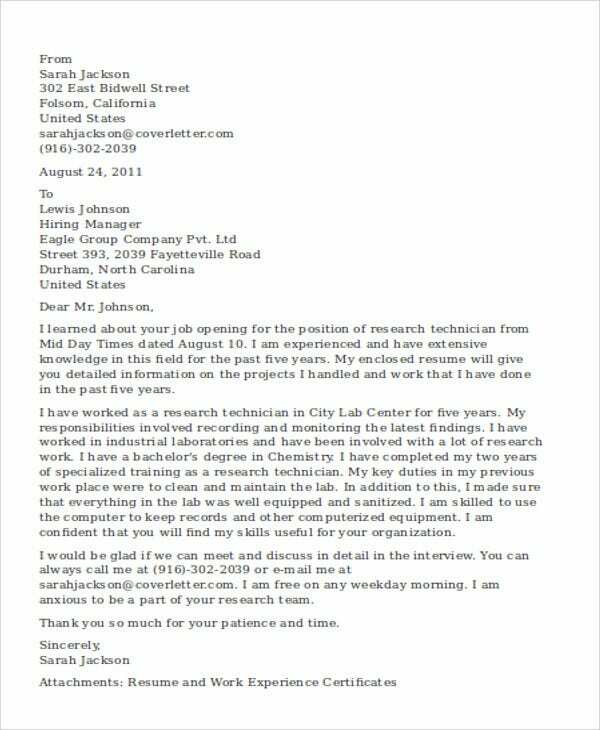 Anyone could evaluate your letter hence it should look professionally presentable firsthand. Letter content. Your ideal professional cover letter should include relevant content such that your readers dig deeper and consider your application. The decency of your application cover letter content could definitely go a long way. Use a template. If you find it difficult to start from scratch in writing your cover letter, an alternative would be for you to download professional Job Cover Letter Templates or Email Cover Letter Templates. Research and development expertise. You are expected to have high expertise in the field of research and development. Since you are applying for the position, you must also prove the mastery that you have guaranteed. Acquired skills through relevant experience. Enumerate all the skills that prospective employers are looking into. Use keywords to that coincide with their preference if possible. Fulfill your writing tasks by simply downloading our Simple Cover Letter Templates and Free Cover Letter Templates.